How do I add a session to a live training? Each live training consists of one or more live training sessions. Having a variety of session dates, times, or locations allows your learners to register for a session that is most convenient for their schedule. After a live training has been created, you can begin adding sessions. Dates within Bridge reflect the time zone of your browser. On the Live Trainings page, click the name of a training. Click the Add Session button. If you want to limit the number of learners who are allowed to register for this session, enter the maximum number of attendees in the Capacity field . Select a date for the session in the Date field . To set a time frame for the session, enter the times in the start and end time fields . Times support 24-hour formatting and reflect the time zone chosen for the session . The end time is automatically adjusted to one hour after the start time. Once the end time has passed, learners will not be able to register for the session. However, learners may still be added manually by an admin if the session has not concluded. If you want to specify a location for this session, enter the location in the Location field . If you plan on conducting a web conference during your training, select the web conference provider from the Provider drop-down menu . Click the Mark learner as attended when launched toggle button to have learners marked as attended when they launch the web conference . Click the Continue to Setup button  to add all necessary web conference information. This information will be included in the notification email that is sent to learners once they have registered for the live training session. If you would like to conduct the live training over multiple dates, click the Multi-part Session button . When enabled, you can add session details for each part. Live training session attendance can only be marked as either present or absent at the session level; attendance cannot be tracked per session part. Any additional information that is useful for the training instructor can be added to the Notes field . Click the Publish button once you are finished adding the session details . The Mark learner as attended when launched toggle button will not appear until a web conference provider has been selected. If you have enabled marking attendance upon launch, attendance will be marked but it will not track whether a learner stays or completes a training. To share a registration link with learners, click the Session Options icon. In the Session Options menu, click the Link icon and copy the provided link. This link can be posted in areas outside of Bridge that may be more visible or frequently visited by learners. 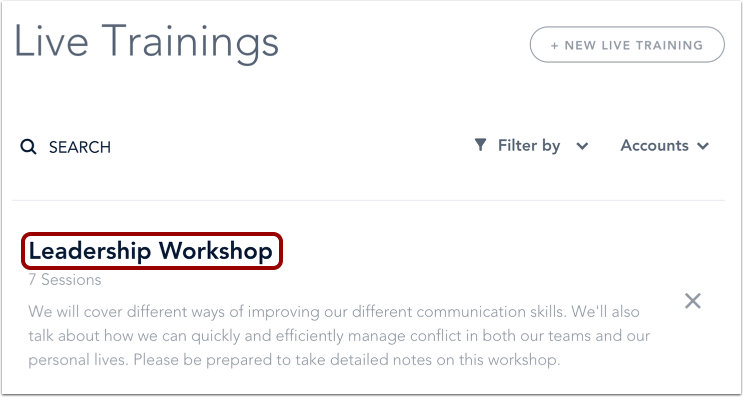 Note: The session link generated by this icon is different than the shareable training link generated by the shareable link icon located at the top of the Live Training Details page. The session link will provide learners with a link to the specific session, while the training link will give learners the option to register for any available session in the live training. To delete a session, click the Session Options icon. From the menu that appears, click the Delete icon. Previous Topic:How do I create a live training? Next Topic:How do I edit or delete a session in a live training? Table of Contents > Manage Live Trainings > How do I add a session to a live training? How do I create a live training? How do I view live training details?